Heart Rate Training That Goes Where You Go! Monitor your heart rate with your Activio Smart Belt or any other Bluetooth Smart (Bluetooth Low Energy/4.0) heart rate sensor, wherever you are! Follow the new heart rate profiles for training with customized class profiles, for even more fun or specialized training. 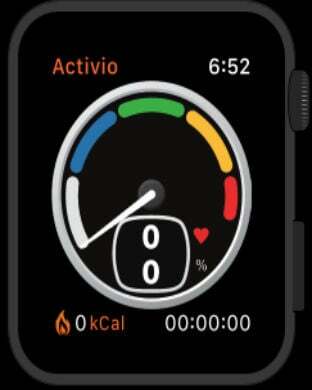 ••• Use your Apple Watch to show the Activio Intensity Meter on your wrist! Your heart rate is presented on the Activio Intensity Meter, using the same, simple five-zone interface users have come to appreciate when using Activio at the gym. The new heart rate real time chart simultaneously gives you an overview of your current session and Class Profile. A voice guide gives feedback in case you don't want to look at the display. Synchronize your results with www.myActivio.com to keep track of all your heart rate training including the results from the Activio System at your gym. Now the app supports downloading of historical training sessions with detailed view. ••• TIP! Turn the iPhone to landscape mode to show a wide full screen curve! • Compatible with iPhone 4s/5/5s/6/6 Plus/6s/6s Plus. Recommended to use iOS 9 or later for full functionality. • Compatible with Apple Watch with watchOS 2.2 or later.